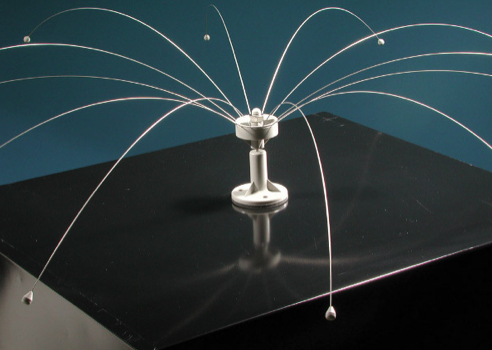 The Stainless Steel Spikes Deterrent is an effective, humane solution for preventing seagulls from landing and roosting on roof parapets, walls, ledges, girders and other narrow flat surfaces. Seagulls cannot land on the un-even surface created by the spikes and will permanently leave the protected area. The spikes are sold in two foot sections, twenty five sections per box totaling 50 linear feet. Spikes are five inches long, fabricated specifically to deter seagulls and other large birds. The flexible base of the spike strip is 1 ½ ” wide and can be glued, nailed, screwed or tied down to most surfaces. These spikes carry an industry leading 10 year warranty from the manufacturer. They are non-corrosive and require virtually no maintenance. These spikes are easy to install using ordinary tools and skills. You supply the hardware to install depending on the surface material. We recommend sealing the installation with a silicone adhesive. Measure the length of the parapet, ledge or wall and order the number of boxes (50 feet in each) that you will need. Installation instructions are available with your order and helpful technical advice is a phone call away. We usually ship within 24 hours of your order. Questions about this product and where to use it most effectively are welcome. Call or email us to discuss the specifics of your seagull infestation and whether spikes are the best answer. Note: Spikes should not be used to protect wide spaces like flat roofs or large roof structures (see SCS Grid Wire Seagull Deterrent Systems). Spikes are very effective protecting narrow areas such as walls, parapets, ledges and girders. Price: $295.00 for each Stainless Steel Seagull Spikes Kit (covers fifty linear feet in two foot sections). Questions? Call at 347-389-5533 or email info@seagullcontrol.com with questions. 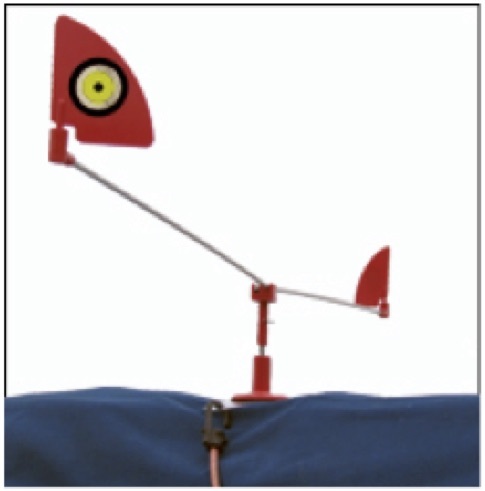 This Wind Powered Deterrent is a spinning visual deterrent used to prevent seagulls from landing on boats, cars, chimneys, roof mounted HVAC or other surfaces about 8 feet across or less. It works most effectively where there are constant breezes, such as boats on moorings or lofty exposed areas. Each unit features reflective “predator eyes” to confuse and scare gulls from coming near the protected area. The arms rotate to cover a 6 foot diameter, but this deterrent is effective several feet beyond that. The base is glued or screwed permanently to the surface you are protecting and the spinning arms are easily detached and stowed for cruising. Or choose one of our optional mounting systems for your specific project. And the spinning arms are easily removed when cruising. Choose one of these optional mounts for your boat, car or other specific situation. The SCS Wind Powered Seagull Deterrent comes in four varieties depending on the area or equipment you are protecting. Shipping will be added at checkout. Note: The Sandbag Mount weighs about 5 pounds because the manufacturer supplies it full of sand. This is more expensive to ship due to the weight. To our customers in Canada: Shipping charges to Canada are about one third more than to US destinations because we do special packaging and handling to facilitate trouble-free delivery by UPS. Our costs are significantly higher, some of which are reflected in higher shipping rates. Sandbag Mount Shipping Charges: Please be advised that sandbags are shipped with the sand inside—the manufacturer’s policy– and weigh just about 5lbs each, which costs us significantly more to ship. This results in a higher shipping price for this product. SCS Seagull Deterrent Spider Kit – our best seller! 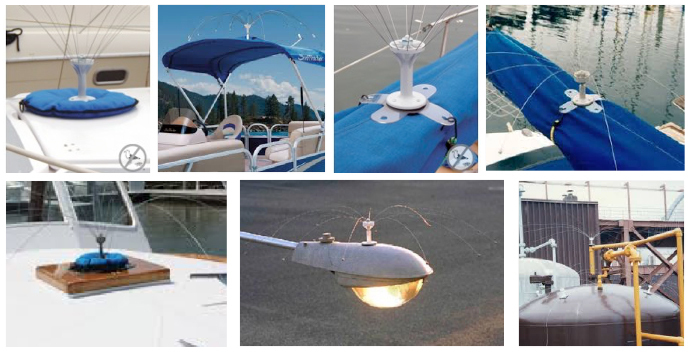 The SCS Seagull Deterrent Spider Kit is the most effective and durable seagull deterrent for boats, boat lift covers, Biminis, boat T-Tops and hardtops, roof- mounted HVAC and chimneys. The Spider’s long, thin, high tensile stainless steel wires, arcing out from the base, shimmer in the slightest breeze and spin in stronger breezes. Seagulls hate the effect and will not land near or under these wires. The deterrent effect extends a foot or a bit more beyond the end of the wires. Not sure what size or mount is best for your application? We welcome your phone calls or emails. The Standard Mount (PV) is a glue-on and/or screw-down PVC mount. This is the choice for a permanent mounting base installation. Best for a hard surface like boat cabin roof, HVAC and chimney, any rough weather environment. The Spider easily snaps in and out of the base, and it folds up, umbrella fashion, for space-saving stowage when you leave for a cruise. The Tie or Bungee Mount (TB) can be bungeed to the frame of your canvas boat or lift cover. This mount enables you to use your own bungees, lines or wires for your particular situation. A flexible and very secure mount. 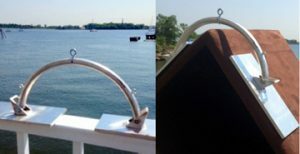 The Sandbag Mount (SB) is ideal for boats, boat lift covers, small swim floats or anywhere you want convenient and easy removal when leaving for a cruise. The sandbag weighs about 5 pounds. It keeps the Spider in place even in windy conditions. It also has holes for extra security with bungees, if you’re concerned about storms blowing it off when you’re away. To our customers in Canada: We use UPS for shipments to all Canadian addresses. They provide trouble-free service including efficient customs clearance and GST prepayment. As a result, on average it costs us $40 more than shipments to US addresses. We add that amount to the invoice, as well as the GST tax for your province. To our customers in Hawaii & Alaska: We use UPS for shipments to your state. The extra cost, on average, is $28 which we add to your invoice. Note on sales tax: We collect and pay sales tax in New York, Illinois and California, the states currently charging us sales tax. These seagull spikes are a cost effective way to prevent seagulls from landing and roosting on roof parapets, walls, ledges, girders and other narrow areas on buildings. The spikes are seven inches high for the most effective seagull protection. Each box contains 25 two foot long sections, enough to protect 50 linear feet of surface against seagull pollution. Seagulls can’t land on the uneven surface that these spikes create. This is a permanent deterrent against seagulls landing, roosting and nesting. The spikes are constructed of durable polycarbonate plastic with UV inhibitors. They carry a five year manufacturer’s warranty. Polycarbonate spikes are non-conductive and non-corrosive. This system is easy to install using ordinary skills and tools. The flexible strips holding the spikes are nailed, screwed or glued in place. Maintenance is minimal. The tough polycarbonate material is durable and long lasting, even in harsh climates. Available Colors: White, Tan, Grey, Black, Brown, Brick Red and Crystal Clear. Custom colors also available to blend with your building, at additional cost. Measure the area you want to protect and order by the box: Each box covers 50 feet. Installation instructions and on-phone technical advice, as much needed, after you order. If you’re not sure if this deterrent system is the most effective solution for your specific seagull problem we welcome phone calls. The Peaked Roof Kit is the solution for seagulls landing and roosting on the ridge line of your peaked roof. Seagulls don’t like to land on a slope so they settle on the peak and if the slope is not too steep they may walk down as they infest your roof. (If seagulls are landing on your gutters and walking up the slope see our Gutter Spikes Kit). Three parallel lines of nylon coated stainless steel bird wire are suspended about 6 inches above the ridge line and along either side of the ridge, preventing seagulls from landing and roosting there. The nylon coated wire lines are supported on ridge brackets spaced evenly about 6-8 feet apart along the peak, from one end of the roof to the other. The brackets can be bent to conform to the angle of slope and fit snugly against the roof. For older roofs you can screw and seal these in. If your roof is less than 20 years old it should not be penetrated to preserve roof warranties. The sealant adhesive we include will secure these brackets to the roof (24 hours to dry before stringing wires). The Seagull Control System Peaked Roof Kit varies in price according to the linear feet of your ridge line and other factors like dormers or gables you want to protect against seagull infestations. Each kit includes all the hardware and components you will need to install this deterrent system, along with online instructions and as much on the phone help as you want. You do not need a roofer or other highly skilled worker to install this, but keep in mind that any work on a rood is inherently dangerous. As a general pricing guideline, a typical 50-60 foot long roof ridge will cost approximately $300-$500, depending on your particular design requirements. Email us photos, ridge line measurements and a description of the area you want to protect for a detailed design and exact price quote. We welcome phone calls to discuss your seagull problem, answer questions and provide our expert advice – no obligation of course. This Kit carries a five year warranty and satisfaction is guaranteed. Give us a call at 347-389-5533 or email info@seagullcontrol.com with questions. Fits snugly on almost any angle of slope from your roof ridge, from flat to very sharp. These brackets carry three parallel lines above and alongside the roof peak, preventing seagulls from landing. Seagulls don’t feel comfortable landing on sloping roofs. When you make the peaks off-limits seagulls will generally leave your roof and find other, more congenial places to roost and poop. (Pelicans stay away too). 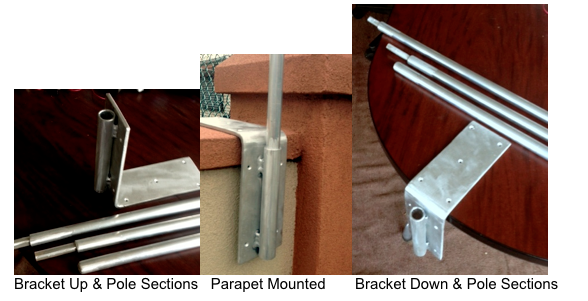 The brackets are made with heavy gauge aluminum parts that will not rust or corrode, even in the harshest climates. The hinged plates can be screwed down to the roof surface and sealed to prevent leaks, but if your roof warranty prohibits any penetration use silicone based construction adhesive that will bond the snugly fitting bases to your roof, no matter what the angle of slope. Each Roof Ridge Hinged Bracket should be spaced 10 to 15 feet apart along the peak of the roof. The Roof Ridge Hinged Bracket Kit® contains the appropriate number of brackets, plenty of nylon coated stainless steel wire and nickel coated copper crimps to attach the wires to the eyelets on the brackets. Pricing: A calculation formula for estimating cost is based on the length of your roof peak: $12-$15 per linear foot of roof peak buys the SCS Roof Ridge Hinged Bracket Kit® which will contain everything you need for easy installation along with detailed instructions for you or your contractor. Email us with the length of your peak, any gables or drop downs (a couple of photos are very helpful) and we’ll quote an exact price along with ordering details. If we need more info we’ll call or email you. We welcome phone calls or emails to discuss your seagull infestation. We’ll answer your questions and recommend the appropriate kit for your roof. 347-389-5533 or email info@seagullcontrol.com and we’ll call you at a time that’s convenient. SCS Seagull Wire Deterrent Kits are used to keep seagulls off ledges, parapets, rooflines, handrails and more. Seagull Wire consists of a nylon-coated stainless steel wire that is suspended between a series of posts along the railing, parapet or ledge. The wire is attached to springs and crimped to the posts. Seagulls will not land on or roost beneath the wires. The posts and wires are low profile, low visibility, and they carry a five year manufacturer’s warranty. This system is guaranteed to end your seagull infestation permanently. Seagull Wire Deterrent Kits can attach to flat or round hand rails, roof parapets, girders and ledges – any narrow surface infested with seagulls. The height of the seagull wire above the surface ranges from 3 1/2 to 6 inches and the posts are mounted with screw-in or glue-down bases. One to three parallel lines of wire are recommended, depending on your particular area, and stainless steel springs keep the lines taut over time. One hundred linear feet of railing, parapet or similar narrow surface protected with two or three parallel lines of wire, all the hardware and other components that you will require. Cost is approximately $300-$400 as a rough estimate without any details known. Email us photos, measurements and a description of the area for a customized Kit description and exact price quote. We welcome phone calls to discuss your seagull deterrent project in detail, with no obligation of course. We have designed these deterrents for hundreds of locations so you can count on a proven solution to your seagull infestation. Canadian, Mexican and overseas customers email/call to discuss shipping options. Five year warranty on all parts. Satisfaction guaranteed. The SCS Grid Wire Deterrent prevents seagulls from landing on docks, decks, flat roofs and other open spaces where they are roosting, nesting or dropping shells. These activities will end the moment you install our Grid Wire Deterrent. Because seagulls inhabit wide open spaces and need a lot of room (compared to land birds) to take off and land they will avoid the location we protect with our custom designed grid system. We have perfected the most effective grid pattern in hundreds of projects like yours and we guarantee our Grid Wire Deterrent will end your seagull infestation immediately and permanently. Our deterrent transforms your dock or roof from a comfortable environment where seagulls feel secure into a hostile environment where the gulls feel threatened – it’s seagull psychology. This is the method recommended by the US Department of Agriculture as the most effective, non-harmful seagull deterrent system. The SCS Grid Wire Deterrent is an array of grids made with nylon-coated stainless steel wire and highly reflective nylon monofilament lines. The wire provides strength and endurance and carries a 10 year manufacturer’s warranty. These grids are supported above the roof or dock surface by aluminum poles (shown above). Custom size poles are available. Heavy duty aluminum Brackets (shown above) are used to mount poles along the edge of docks or parapets (down) or on the parapets or docks (up). Our brackets do not penetrate roof surfaces and can be customized for just about any situation. 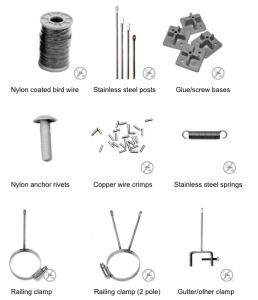 All SCS Grid Wire Deterrents are shipped with the components you’ll need to install, including nylon coated stainless steel wire in the quantity your customized design will require. 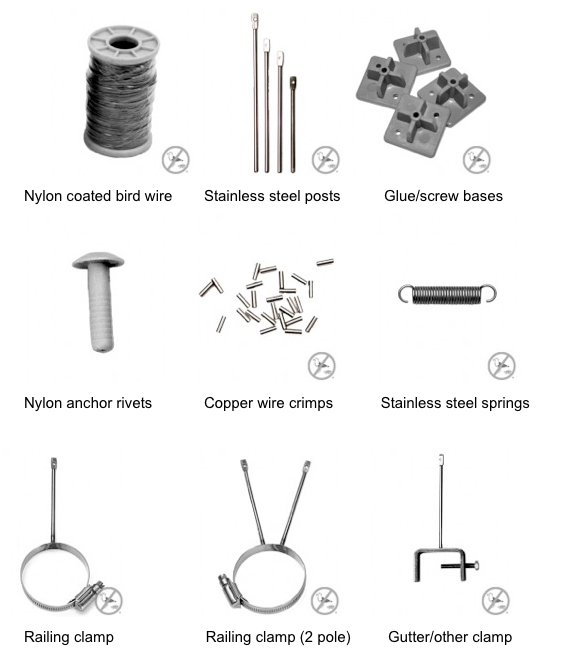 Included are copper crimps for attaching wires to aluminum poles in the heights you want. Our heavy duty aluminum welded brackets won’t break or corrode. If needed, we supply guy-lines and rings for attaching to poles. Complete installation instructions are included and all the on-phone help you want. We will work closely with you or an installer of your choice, or we can arrange installation by professionals anywhere in North America and Mexico. Our Grid Wire Deterrent system is manufactured to be virtually maintenance free in the harshest marine climate. The entire system carries a ten year warranty on parts. Contact us to discuss your seagull infestation and our Grid Wire Deterrent solution. Consultation and a preliminary customized design are absolutely free with no obligation. No one knows seagull problems like we do. Call us with your questions anytime. Call at 347-389-5533 or email info@seagullcontrol.com with questions. Thank you for ordering your seagull deterrent system. The link you clicked enables you to complete the order without a specific price. This authorizes the credit card transaction but we are not actually charging your account. The cost of your seagull deterrent product, plus shipping and taxes (if applicable) will be charged to your card when we ship. At that time you will be charged the price we quoted (plus shipping and taxes) when you placed your order. To complete this transaction click Add to Cart below. Then scroll to the top of this page and click Checkout. Fill out the form, making sure you enter the billing address for your credit card statement exactly as shown on the statement. You can specify a separate ship-to address. If you encounter any problems give us a call (347-389-5533) or email info@seagullcontrol.com. Airzyme Waste Digester is used to safely clean, digest and deodorize seagull excrement. This product is approved by the US Department of Agriculture. Clean roof mounted HVAC to prevent spreading pathogens inside. Safe and effective for residential and commercial use. No special equipment needed but always wear protective gear when cleaning seagull pollutants. .Sold in one-gallon containers. Price: $95.00. On sale for a limited time at $79.00. 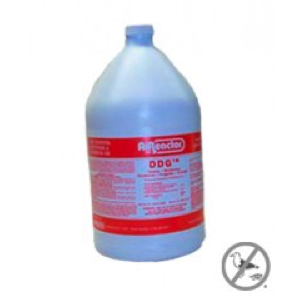 Microcide SQ is a broad spectrum hospital grade disinfectant/cleaner for use on surfaces polluted with seagull feces, especially where food is handled or consumed, where children play such as swim floats, ladders, hand rails and similar places. 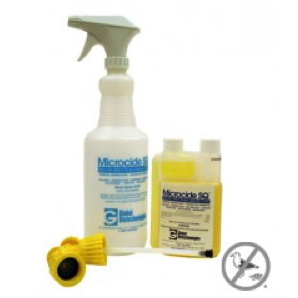 This product is approved by the US Department of Agriculture to safely clean food and non-food surfaces. .
Microcide SQ is a concentrate sold in two 8oz containers along with two spray bottles and nozzles. The concentrate is diluted with water so each 8 oz container makes 4 gallons of disinfectant/cleaner. Price: $125. On sale for a limited time at $105.00. 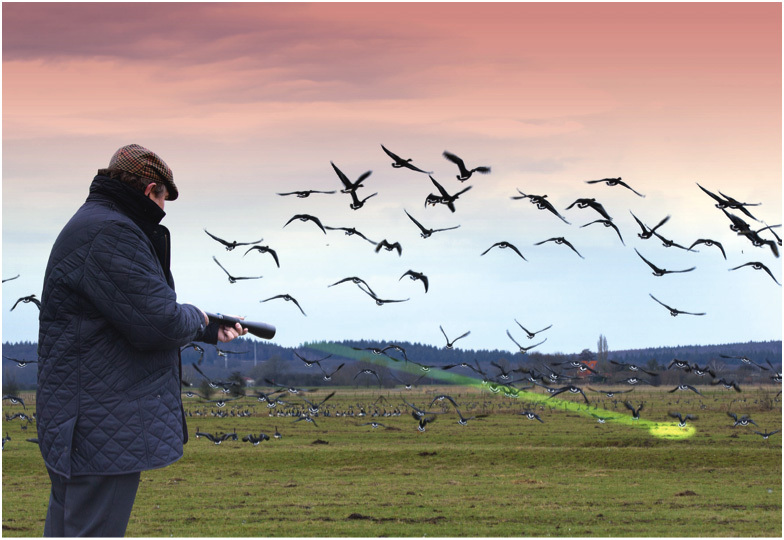 Our Agrilaser – Money-Back Offer: Let’s face it, effective seagull deterrent lasers are expensive. Don’t waste your money on cheap lasers, they won’t do the job. Before you invest in this technology we have a plan to help you determine whether the laser you choose is right for your seagull problem. Buy the Agrilaser Handheld, Handheld 200 or Handheld 500. Try it for 15 days. If you are not satisfied, return it to us for a full refund (less our shipping cost). No, there is no catch. Our only caveat: Make sure the laser is in like-new resalable condition, so handle your laser gently during the trial period. The Agrilaser, originally developed in Europe to protect crops from birds, is very effective against seagulls. This hand-held laser, about the size of a flashlight, is safe and easy to use. Advance the beam toward the seagulls and the entire flock will leave your property. Use this frequently, as often as practical, for several weeks to months. The seagulls will grow increasingly wary and begin to seek other places to roost and pollute. You are training them to fear you and your property. You’ll see immediate results. But keep it up. After you have ended the seagull infestation, keep the Agrilaser handy to scare off occasional seagull landings. Most other birds fear this too. This laser is very effective against geese, pelicans and other waterfowl, as well as vultures and terrestrial birds. Use the Agrilaser in conjunction with our SCS Grid Wire Seagull Deterrent where seagulls have a very intense attraction, such as habitual nesting areas and roosts near food sources– solid waste transfer facilities, aquaculture and seafood operations. The Agrilaser Handheld models are powerful lasers and recommended for outdoor use in brighter light conditions. Effective up to 1000 meters on cloudy days, less in bright sunlight, depending on the model you purchase. We also carry the Agrilaser Autonomic. They operate remotely on a programable time/date schedule and a pattern that you set up with a laptop. These powerful lasers range in price from $8000 to $10,000, depending on features. They are Intended for agriculture, aquaculture and other large acreage. 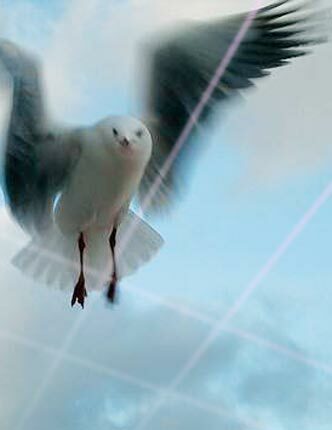 Click contact us to discuss a laser solution for your seagull problem. The MegaBlaster Pro, Sonic Bird Repeller, uses intermittent distress calls to create a “danger zone” that frightens infesting birds away for good. PREDATOR cries help scare all the birds. PERFECT FOR FISH FARMS, AIRFIELDS, LANDFILLS, FARM FIELDS OR ANY MULTI-ACRE FACILITY. Our most powerful system features two high-output amplifiers that drive our specially-designed 20-speaker tower. The intense sound output covers up to 30 acres (12 hectares). 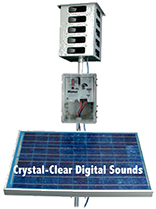 It features solid-state electronics mounted inside a NEMA-type control box, suitable for almost any application. The generating unit mounts easily to a post or pole using the included mounting hardware and bracket. The unit comes pre-recorded in four different configurations for the most common bird infestations. Choose any or all of the 8-sounds, including predators, to give the birds even more of a sense of danger. Then customize by choosing volume and silent time between sounds. Guaranteed to Repel your Seagulls. Ask us about our money-back guarantee. Seagull Control Systems guarantees the Mega Blaster-Pro will substantially alleviate your seagull infestation. Call 347-389-5533 or Email us for details. Note: This unit is capable of sound output up to 125 decibels. Hearing protection is recommended.